On Thursday morning, teachers attending a peaceful protest were attacked by security forces with batons, tear gas and pepper spray. Reports from the MEK sources in the scene say that between 40-50 teachers were arrested for participating in the protests. 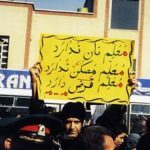 Isfahan’s teachers were responding to a call on social media to protest and had gathered in front of the city’s Education Department to protest the regime’s failure to meet their demands. The mostly-female educators held their demonstration despite threats and intimidation from regime security forces and intelligence agents leading up to the protest. Teachers were warned that anyone participating in the protest would face dire consequences. On Thursday morning, security forces were deployed in the streets around the Education Department in Isfahan, and riot police fired tear gas into the crowd of protesters as the demonstration began. The teachers continued their protest despite these acts of suppression. She went on to say, “We are part of a society where 90% of the people live under the line of poverty. Now you want me to talk about my condition? Your show is a farce.”. Security forces saw a woman recording the violent attacks on the peaceful protests and tried to arrest her, but onlookers saw her being attacked and came to her rescue, helping her to escape. Thursday’s protests follow two nationwide strikes by Iranian teachers this year. Teachers have been forced to close their classrooms and face arrest and intimidation because of unbearable conditions. The teachers have demanded better wages and benefits, implementation of agreed-upon policy changes, better classroom conditions, and the release of their detained colleagues. 98 teachers were arrested or summoned in the two teachers’ strikes this year, many of who still remain in prison. Activist teachers are frequently imprisoned for organizing and advocating for teachers’ rights, and many serve lengthy prison sentences. Mrs. Maryam Rajavi, President-elect of the National Council of Resistance of Iran (NCRI), hailed Iran’s teachers who continued their protests despite the repressive actions of the regime. She asked the people of Isfahan, particularly the youth, to stand in support of the teachers and to protest their arrests. She further called upon human rights activists, trade unions, and educators from around the world to support Iran’s teachers and to take immediate action to secure the release of those teachers arrested during Thursday’s protests. The MEK strongly supports Iran’s teachers in their protests and their demands for better pay and working conditions. 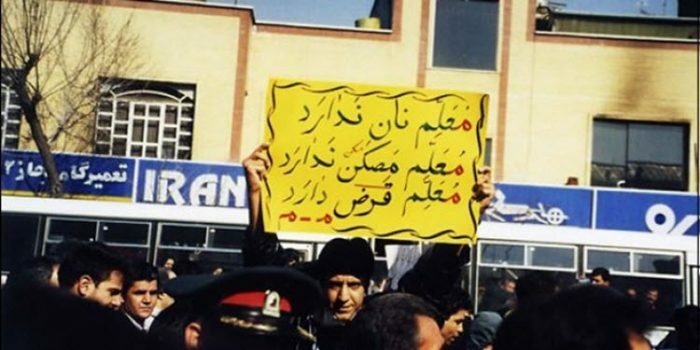 Workers across Iran have shown through their protests over the past year that they are unhappy with the regime and its policies, which have left them poor and without the freedom to express their dissatisfaction. The MEK and the NCRI offer a democratic alternative to the brutal suppression of the mullahs’ regime, one which will free the people of Iran.